When a company that specialises in making TVs and washing machines decides to make a smartwatch, it's impossible not to think the worst. The Haier Watch though, can definitely be considered one of the smartwatch surprises of MWC. The Huawei Watch lookalike is stylish, will run on full Android Marshmallow when it launches in April for €200, and did we also mention it actually looks really nice? Haier also makes smartwatches for kids and the elderly, but it's the grown up model that really strikes a chord here. There's a gorgeous, water resistant stainless steel 42mm casing and a metallic band that has a very Apple Watch Milanese loop look and feel to it. There's leather and mesh straps available as alternatives, but the metal band is certainly the more eye-catching of the options. It's not too heavy to wear and while it feels like a very male-focused watch, it's not too bulky either. Things get better when you notice that the 1.4-inch touchscreen display is exactly, fully round. There's no ugly black tyre at the bottom of the screen. Take that Moto 360 2. The 400 x 400 resolution screen is rich, vibrant and super sharp, putting it up there with some of the best smartwatch screens I've seen. It's slick and responsive as well. The only other thing breaking up the minimalist look is the single button where you'd find the crown on a traditional watch, but that's just used to turn the screen on and off. 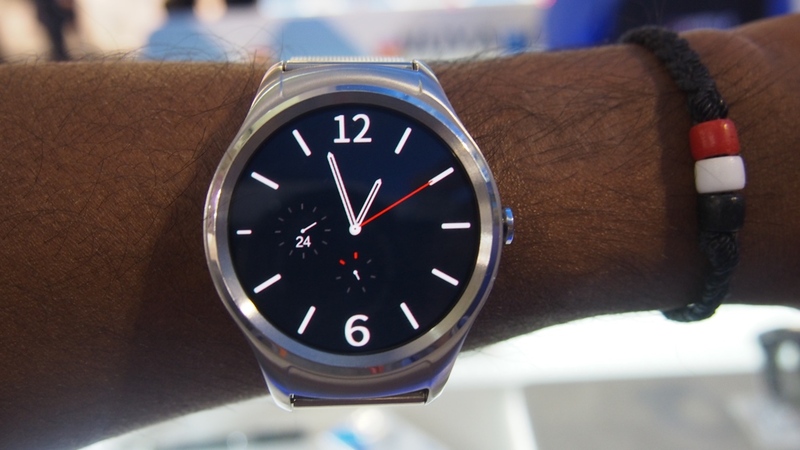 The big talking point here is that it runs full Android and not Android Wear. That means you can download apps from the Google Play Store, but without an internet connection or a paired phone, I didn't have the opportunity to see how well the Android integration worked. Visually, it doesn't look like Android though thanks to Haier's decision to put its own custom user interface on top of Google's OS. Navigating does feel very similar to Android Wear. Swiping left reveals a handful of watch faces, pressing on the screen takes you into the app menus. It's all the things you'd expect to see like sections for messages, calls, calendar and app notifications. There's a pretty slick looking music player that means you can use the built in speaker to listen from your wrist with 8GB of storage to pack some music on. That speaker does also mean you can make and take calls too. Haier is also including what it's calling an intelligent health platform. So you'll be able to count your steps, calorie burn and the Watch will automatically exercise activities. You can also take heart rate readings from the optical heart rate sensor packed into the back of the watch case. The 80+ bpm (beats per minute) readings I recorded seemed excessively high though. For €200, you're getting a lot for your money here with the Haier Watch. It looks the part and ticks most of the smartwatch feature boxes. The lack of Wi-Fi support to use it when it's not connected to a phone is a disappointing omission. Getting the best out of Android Marshmallow is going to be the interesting thing here. This wasn't the finished model, and it was quite obvious to see that there's some question marks about how well it's going to run Android apps and integrate the best features of Google's OS. One's thing for sure, I'm definitely intrigued to spend some more time with it to find out.